filter and httpccm modules are not interfacing any Perspective broker, they are facilitating the reuse of created filters and HTTP Client connectors in MO and MT routers, e.g. a HTTP Client connector may be created once and used many times in MO Routes. Every User must be a member of a Group, so before adding a new User, there must be at least one Group available, Groups are identified by GID (Group ID). When listing a disabled user, his User id will be prefixed by !, same thing apply to group. Setting none value to a user quota will set it as unlimited quota. Authorizations keys prefixed by http_ or smpps_ are only applicable for their respective channels. It is possible to increment a quota by indicating a sign, ex: +10 will increment a quota value by 10, -22.4 will decrease a quota value by 22.4. It is possible to increment a quota by indicating a sign, ex: +10 will increment a quota value by 10, -2 will decrease a quota value by 2. When listing a disabled group, its group id will be prefixed by !. MO Route is used to route inbound messages (SMS MO) through two possible channels: http and smpps (SMPP Server). When a MORoute is considered (its Filters are matching a received SMS MO), Jasmin will use its Connector to send the SMS MO. Check The message router for more details about Jasmin’s routing. When choosing the MO Route type, additional parameters may be added to the above required parameters. When routing to a smpps connector like the above example the user_1 designates the username of the concerned user, if he’s already bound to Jasmin’s SMPP Server API routed messages will be delivered to him, if not, queuing will take care of delivery. It is possible to use a RoundRobinMORoute with a mix of connectors, example: connectors smpps(user_1);http(http_1);http(http_3). It is not possible to use a FailoverMORoute with a mix of connectors, example: connectors smpps(user_1);http(http_1);http(http_3). 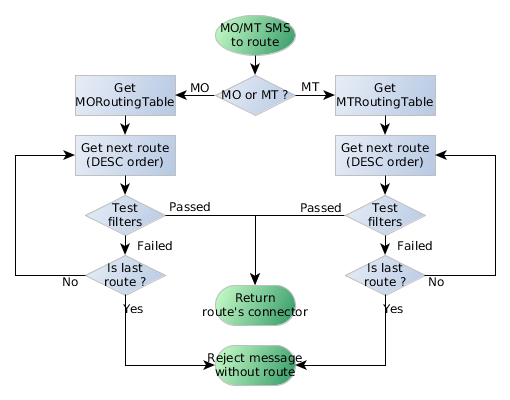 MT Route is used to route outbound messages (SMS MT) through one channel: smppc (SMPP Client). When a MTRoute is considered (its Filters are matching an outgoing SMS MT), Jasmin will use its Connector to send the SMS MT. When choosing the MT Route type, additional parameters may be added to the above required parameters. MO Interceptor is used to hand inbound messages (SMS MO) to a user defined script, check Interception for more details. When a MOInterceptor is considered (its Filters are matching a received SMS MO), Jasmin will call its Script with the Routable argument. Check Interception for more details about Jasmin’s interceptor. When choosing the MO Interceptor type, additional parameters may be added to the above required parameters. As of now, only python2 script is permitted. Pay attention that the given script is copied to Jasmin core, do not expect Jasmin to refresh the script code when you update it, you’ll need to redefine the mointerceptor rule again so Jasmin will refresh the script. MT Interceptor is used to hand outbound messages (SMS MT) to a user defined script, check Interception for more details. When a MTInterceptor is considered (its Filters are matching a received SMS MT), Jasmin will call its Script with the Routable argument. When choosing the MT Interceptor type, additional parameters may be added to the above required parameters. Pay attention that the given script is copied to Jasmin core, do not expect Jasmin to refresh the script code when you update it, you’ll need to redefine the mtinterceptor rule again so Jasmin will refresh the script. A SMPP Client connector is used to send/receive SMS through SMPP v3.4 protocol, it is directly connected to MO and MT routers to provide end-to-end message delivery. When adding a SMPP Client connector, only it’s cid is required, all the other parameters will be set to their respective defaults. Connector restart is required only when changing the following parameters: host, port, username, password, systemType, logfile, loglevel; any other change is applied without requiring connector to be restarted. Updating an existent connector is the same as creating a new one, simply type smppccm -u <cid> where cid is the connector id you want to update, you’ll run into a new interactive session to enter the parameters you want to update (c.f. SMPP Client connector parameters). In addition to predefined filters listed above (Filter manager), it is possible to extend filtering with external scripts written in Python using the EvalPyFilter. This example will provide an EvalPyFilter (SimpleThirdParty) that will match any message coming from the connector with cid = abc. It is possible to check for any parameter of the SMPP PDU: TON, NPI, PROTOCOL_ID … since it is provided through the routable object. Using EvalPyFilter offers the possibility to call external webservices, databases … for powerfull routing or even for logging, rating & billing through external third party systems. More examples in the this FAQ’s question: Can you provide an example of how to use EvalPyFilter ? A HTTP Client connector is used in SMS-MO routing, it is called with the message parameters when it is returned by a matched MO Route (Receiving SMS-MO for more details). All values are collected during Jasmin’s uptime and they are lost when Jasmin goes off, Stats manager shall be used for monitoring activities but not for advanced business reports. The Stats manager covers different sections, this includes Users, SMPP Client connectors, Routes (MO and MT), APIs (HTTP and SMPP). #User id  SMPP Bound connections  SMPP L.A.            HTTP requests counter  HTTP L.A.